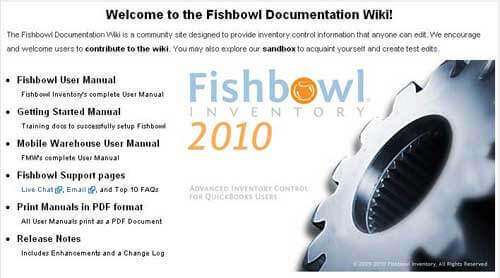 Did you know that Fishbowl Inventory has a wiki with an exhaustive amount of information in short, easy-to-read articles on its many services? Now you do! We invite you to browse through our wiki to find the topic you’re most interested in. We cover everything from basic system setup to advanced features and useful tips and tricks. What is a wiki? It’s a collaborative website that allows basically anyone to add and edit content on it. In the case of the Fishbowl Wiki, you have to sign up to be able to add or edit questions and answers on it. The main sections of the wiki include Getting Started, User Manuals and Fishbowl Support. Are you just getting started with Fishbowl Inventory or are you interested in which features it has? Check out the Getting Started Manual to find training videos, installation and setup instructions, plus information on Fishbowl’s QuickBooks integration. If you already use Fishbowl software, you can find more-detailed information in the user manuals for Fishbowl Inventory and Fishbowl Mobile Warehouse. We also have PDFs of the manuals for a number of our recent software releases, and information on the features contained in each new release. If you have a question that you’re not sure where to find the answer to, a good place to start is in the Fishbowl Support forum. There, you can find FAQs, tips and tricks, glossary of commonly used terms, troubleshooting assistance and more. We’re happy to answer your questions about our products and services. Visit the Fishbowl Wiki to get a taste of our excellent customer service and high-quality inventory management software.